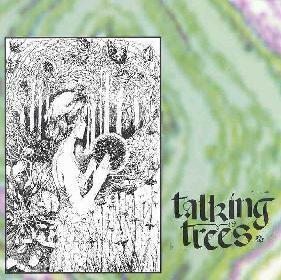 From England comes the debut album by folk-pop-psych ensemble Talking Trees. The promo sheet makes analogies to Jefferson Airplane, the Byrds and Simon & Garfunkel, and those couldn't be more accurate. The bands consists of Sean Robert Chambers on guitars and vocals, Stephen O'Sullivan on bass, Steve Tucker on organ and piano, and Dan Barrow on drums. The album includes 14 tracks, all characterized by beautiful flowing melodies and tender folky vocals. The Byrds influence is mostly heard in the guitar patterns, and while Sean Robert Chambers doesn't necessarily sound like Simon or Garfunkel it's the singing that most reminds me of that classic duo. And the songwriting is excellent. These are songs that will stick in your head after the first listen. "Somewhere Upon Worlebury Hill" and "Steel Plastic Centipede" are among my favorites. They're both gorgeous slices of pop-psych with intricate little instrumental embellishments. "Wicken Fen" and "Lather" (a Jefferson Airplane cover) both have a more traditional folk sound, though "Wicken Fen" also has a Celtic flavor while "Lather" has some brief but mind-bending trip guitar bits. Another highlight is "Faroe Smiles", one of the heavier songs of the set, having a bit of a tripped out jam quality. And the organ really comes to the forefront on this one too. And speaking of tripped out jams, this band of delicious 3-4 songs closes their set with "We Walk The Wheel", a 9 minute psychedelic freakout of liquid loops and acid jams. What a sweet ending! Yeah, there's no question these guys would have been on the charts 30+ years ago. But though the Talking Trees wear their influences on their shirt sleeves there's a freshness and vitality to them that defies the retro label. Fans of well crafted 60's psych-pop songs can't got wrong. For more information you can visit the Talking Trees web site at: http://www.talkingtrees.com. Talking Trees is distributed by September Gurls. You can visit their web site at: http://www.septembergurlsrecords.com. Contact via snail mail c/o September Gurls Records; Sigmundstr. 92; 90131 Nürnberg; Germany.